Gifts for Valentine's Day, Vintage Weddings, Anniversaries, Birthdays, Holidays, Graduations, Prom and more! Vintage Earrings, Rings, Bracelets, Wallets, Cigarette Cases, Brooches, Compacts, Purses, Eye Glass Cases, Cufflinks, other Jewelry and Accessories! Vintage Elgin Cigarette Case In Mother of Pearl and Gold Tone. Business Card Holder - Le Cas de Cigarettes. Vintage Rose Earrings in Orange, Bridal / Vintage Wedding - Boucles d'Oreilles. Vintage Cigarette Case in Turquoise Mother of Pearl with Leaf Cut Out in Gold Tone - Business Card Holder - Le Cas de Cigarettes. Vintage Chandelier Earrings in Peach, Bridal / Vintage Wedding Earrings - Boucles d'Oreilles. Vintage Blue Rhinestone Earrings, Gold Tone, Bridal / Vintage Wedding Earrings - Boucles d'Oreilles. 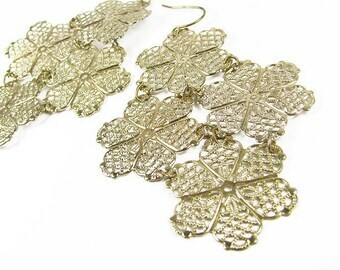 Vintage Chandelier Earrings, Disco Earrings, / Vintage Earrings - Boucles d'Oreilles. Arrived adorably gift wrapped and quite fast! Thank you! Vintage Cigarette Case with Old Fashioned Portrait. Pill box - Le Cas de Cigarettes. Adorable! Perfect condition! Nicely packaged! Bonnie is our little rescue mutt : ) We think she was born in the wild. She is very sweet, but very shy. Welcome to My ChouChou! I named my shop My ChouChou because I love and adore vintage everything! Chou chou means my little darling in French, so I though it was a suitable sweet name for my vintage shop :) I love finding little treasures everywhere and anywhere that sometimes need a little fixing up, which is really fun! This way things get used again and it brings a story and character to the pieces at the same time! Vintage Jewelry and Accessories for Him and Her! I want every My ChouChou customer to be HAPPY : ) with their shopping experience and to visit again : ) I list the item age and condition to the best of my knowledge. If anything has been overlooked, please know that it's not intentional. If there is a question about anything, we will sort it out and resolve it. Thank you for visiting : ) Best wishes! Please understand that all vintage items have been used and are older than 20 years, which means they won't be perfect, unless they are new stock vintage. If they are, this will be stated. If anything has been overlooked, please know that it's not intentional. I do my best to describe each item and any flaws they might have. I list the item age and condition to the best of my knowledge. VISA, Mastercard, American Express, Discover and PayPal is the accepted method of payment. Vintage and antique means used and older, so vintage and antique items won't be in new or perfect condition (unless noted as unused, new stock, and/or in box). These items have a history and have been previously owned, which is what makes them unique. 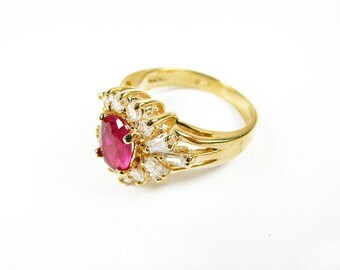 Any major flaws will be noted in the description, but minor flaws or wear due to use and/or age should be expected for vintage and antique items. I do my best to describe each item and any flaws they might have. If something has been overlooked, please know that it's not intentional. I list the item age and condition to the best of my knowledge. Colors may vary slightly depending on the setting of your monitor. Enjoy these wonderful pieces and imagine the stories they could tell!